You get what amounts to a free Google Home if you pick up this bundle. Now is a good time to get started on smart home plans for yourself or someone on your gift list: Today, Best Buy is selling a Philips Hue smart bulb-Google Home bundle for $199. Usually that price would cover the Philips Hue bulb package alone. 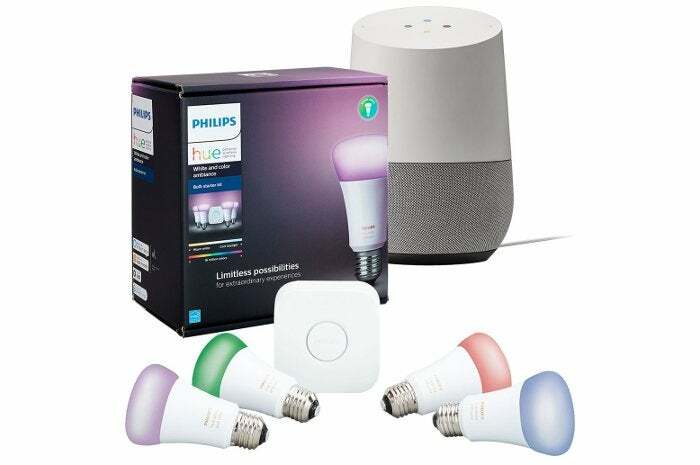 The bundle includes four Philips Hue white and color ambiance bulbs, a Philips Hue Bridge, and a Google Home smart speaker. Philips Hue is a popular choice for smart light bulbs, and when we last looked at them in late 2016—Philips has released a new generation since then—we found them to be the "best-looking bulbs on the market." As you might guess from the bundle, they also work with Google Home, which allows you to control the lights via voice commands. If you've already got a smart assistant running in your home, Amazon's also got the same Philips Hue 4-bulb kit for $140. It's not clear how long either of the sale prices will last, so don't wait long if you're interested.